Father of four Moli, 44, is one of the most successful cocoa farmers on the island of Malo, Vanuatu, where he lives. Back in early 2000, with limited knowledge of modern farming techniques or farm management skills, Moli planted 300 cocoa plants, but the plants did not flourish as he had hoped. He hadn’t maintained the plantation or harvested cocoa since 2007. His cocoa plantation was overgrown and he couldn’t distinguish between the cocoa plants and other trees. In September 2015, he harvested approximately 5kg and the same amount in February 2016. “For seven years, my family struggled to harvest cocoa; branches were everywhere because I hadn’t done any pruning all this time. But thanks to this World Vision program things changed. “In early March 2016 I was introduced to the Vanuatu Agricultural Research and Technical Centre site where I quickly learnt pruning methods, and by the end of the same month, I had pruned my cocoa plantation,” Moli said. Moli’s hard work paid off when he earned AUD$841 around Christmas 2016 compared to the AUD$168 he earnt twice per year in the past. 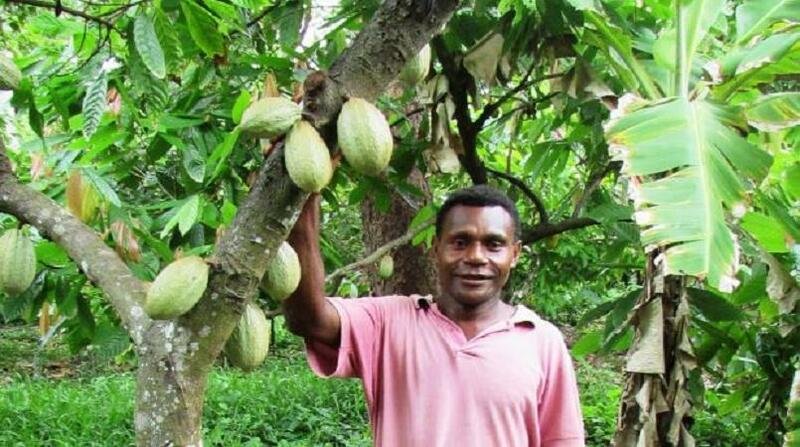 World Vision’s Sanma Community Economic Development project, funded by the New Zealand Aid Programme, supports farmers on Malo Island to improve the quality and quantity of their cocoa. Farming techniques such as pruning, spacing and fermentation were also passed on to other farmers, who were not directly involved in the programme, by twenty-four farmers who attended the training. This has also led to an increase in their income. “Farmers directly involved in the program now have solar panels installed on their houses to improve lifestyles since there is no electricity on the island. They can pay their children’s school fees for the upcoming academic year and also cover other household needs,” Vomboe said. World Vision has connected farmers with ACTIV (Alternative Communities Trade in Vanuatu), a non-profit organisation that works closely with cocoa farmers on Malo, by facilitating fair trade for local products. ACTIV helps farmers earn an income by purchasing their products if there’s a delay with the OKEANOS, a sea vessel used by ACTIV to purchase cocoa in the archipelago. The project has increased production and income through sustainable production and processing practices and by facilitating access to financial and business services to help farmers understand and engage with the market. Since March 2016, Moli has planted an additional five hundred cocoa trees. His wife Monique said all the households’ needs are now being met and they even manage to save some money. “Our lives have changed since my husband learnt new farming techniques. We saved AUD$276 in December alone for school fees. Now we have solar panels to generate light and our children can study to have a better future,” Monique said.